April is the month of Fools, and with Mercury conjunct Neptune this April Fool’s Day (technically exact on the 2nd), that’s especially true this year. The origins of this odd Western holiday are unclear. Nevertheless, it evokes the archetype of the Fool: clown, comedian, innocent, and wise man. 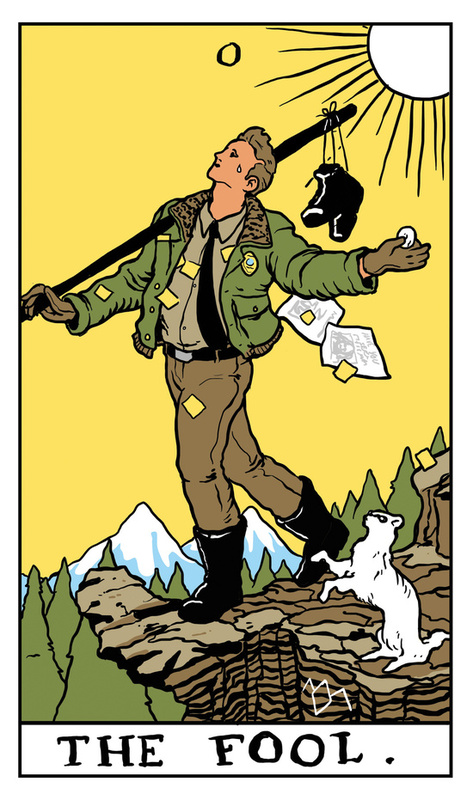 This is a card of starting off on new adventures, of the sacred naivete of someone who knows that they know nothing, and of the willingness to take a risk. The Fool speaks in riddles, especially when Mercury in Pisces meets Neptune. As we make our way through the month, consider the wisdom of childlike play. We have a dark moon at 15 Aries on April 5th. This moon squares Saturn in Capricorn, indicating that making a brave new beginning with this lunar cycle will require us to overcome challenges. Saturn is the set of weights you have to lift to build muscle or the schedule to which you stay accountable when you want to accomplish an important project. His influence is not inherently bad; it just always spells hard work. Only (non-sacred) fools think they can get everything they want without working for it. Set the intention to overcome a challenge with this new moon. Then, do the work throughout this lunar cycle. We still have Venus in Pisces for most of this month, giving us more fantastical, musical mermaid vibes. Mercury is still in Pisces for most of April too, and though this sign is not an easy fit for this planet, the placement does speak of unusual creativity. Muting Mercury’s “normal” logic and speed results in slow, unexpected poetry. Both Mercury and Venus take turns sextiling Saturn and Pluto in Capricorn (from the 7th through the 14th). These Pisces-Capricorn sextiles are somewhat friendly offerings to take what we learned during the weird Piscean March of 2019, take responsibility for what we can control, and use our imaginations to transform circumstances. Jupiter stations retrograde at 24 Sagittarius on April 10th. We have a lot of hype about retrogrades right now, so relax, because Jupiter is retrograde for about five months every year. If you have natal Jupiter retrograde, you’re in good company. Jupiter Rx is still jovial. You can still be ambitious and test your luck. This retrograde period will take Jupiter from 24 to 15 degrees of Sagittarius, stationing direct on August 11th. You can time positive shifts with the retrograde and direct stations of this maximalist planet. Use this retrograde to review what you learned from mid-January through April, to revisit past adventures, and to prepare for future opportunities. If you fall off your horse, just get right back on. At the same time, the sun in Aries begins squaring everything in Capricorn, starting with Saturn on April 10th. Aries season is all about new adventures, beginnings, and winning. Aries likes to be first. So in between the dark moon in Aries and our upcoming full moon in Libra, we must meet yet another set of challenges. Play to win. When the sun squares the moon’s nodes on the 12th and Pluto on the 13th, make sure that you’re playing the game for the right reasons. What are you nurturing? Why do you care? As we make our way to the full moon mid-month, Mercury and Venus square Jupiter from Pisces (on the 12th and 15th). This set of squares has us looking at our dreams again—are we dreaming big enough? Too big? Envision what you might dare to do with the rest of the time that Jupiter is in Sagittarius. Start making your biggest plans for the final push when Jupiter is direct (August 11th through December 2nd). The sun makes a trine to Jupiter from Aries on the 15th, an aspect that speaks of energy, adventure, luck, and fun. On the 17th, Mercury finally leaves Pisces and moves into Aries. Mercury here is original, opinionated, direct, and quick to make a decision. So if you’ve been mulling over something while Mercury floated through Pisces, you may figure it out fast once he gets into Aries. Mercury meets Chiron immediately (exact on the 19th), so prepare to think and maybe even talk about healing your personal wound of authenticity, rage, or masculinity. Our full moon this month is at the last degree of Libra, on April 19th. This one squares Pluto in Capricorn, indicating a transformative transition. The moon also opposes Uranus in Taurus, which combined with the Pluto square, takes the late-Libra placements in the room right back to the change-making earthquakes of 2012 - 2015. During that time, all of the Cardinal signs were engaged in major life changes. This is now, not then, so the key difference is that Uranus is in Taurus instead of Aries. We’re growing something sustainably innovative now. The next day, April 20th, the sun enters Taurus and meets Uranus (exact conjunction on the 22nd). All of the Uranian Bull themes—rewilding ourselves and our world, hedonistic innovations, and pleasure revolutions—are highlighted with the sun here. When the sun is in Taurus, we begin to feel the real warmth of spring. Things will heat up fast with Uranus involved. Also on the 20th, Venus moves into Aries and meets Chiron (exact conjunction on the 23rd). Venus in Aries is independent. Though Venus is a planet of relationship, Aries is the sign of self, so here she is more focused on herself and has difficulty sometimes relating to others. However, Venus here is fun, adventurous, and passionate. When she is with Chiron, we feel that wound of identity healing. Do your best to relate to others who may struggle with similar wounds at this time. We have two more outer planets station retrograde at the end of the month. Pluto stations retrograde at 23 degrees of Capricorn on the 24th. This is another one that happens for five months every year, and it’s nothing to worry about. Pluto’s retrograde period is a time to reflect on power—how you’re empowering or disempowering yourself and/or others—and the various death-rebirth cycles we all go through as we change in life. Pluto will station direct at 21 degrees of Capricorn on October 3rd. On the 29th, Saturn stations retrograde at 21 degrees of Capricorn. Again, this is a planet that stations retrograde every year for about 4 ½ months. It’s normal to have outer planet retrogrades, and it’s also normal to have them retrograde at the same time, so this is all business as usual. When Saturn stations retrograde, we become more aware of our limitations and responsibilities. Saturn will station direct at 14 degrees of Capricorn on September 18th. While Saturn backtracks over the middle degrees of his home sign, we can review what we’ve accomplished, address setbacks, and plan the next leg of our climb up this mountain. You want to be making uphill progress, not leaping off mountain cliffs without a parachute. Carry with you the sacred innocence of a fool beginning new adventures this month—along with the wisdom you’ve accumulated so far. Brittany Goss is a life coach, astrologer, and writer based in Brooklyn, New York. The Aries New Moon on April 7th 2016 was conjunct Uranus, unconventional planet of individuation, disruption, and surprises. This was the day I decided to shake things up by acknowledging one of my more unconventional traits - a passion for astrology - and turning it into a business. I started feeling the effects of this new moon one week earlier, on April Fool's Day, when (after some planning) I quit an enervating day job. Like the Tarot Fool, I have started on my own journey, armed only with trust and faith. It's not a traditional career move, but with Saturn transiting my natal Uranus in the sixth house of work, my freedom was being restricted and I chose liberty over security. This is my startup vision: cosmic inspiration and accurate timing for unconventional people who want to lead original lives. Since 2011, we've been living in the time of Uranus in Aries. Disrupt, innovate, hack: this is the energetic, somewhat violent language of the trickster planet in the sign of the Ram. With startup culture, we've been ramming our way into change; racing toward the future at full speed. While it's been exciting, a part of me is looking forward to Uranus' shift into the more earthy, feminine energy of Taurus in 2018. Until then, I'd like to propose a new way to rebel: studying the movements of the cosmos, acting with astrological foresight, and becoming true tricksters by thinking outside of the boundaries of gender, race, and sexuality. Like the writer Anais Nin, who had Uranus conjunct her moon in the third house, I don't want to become normal. This is a place for those who want to develop even more unconventional traits. Astrologer in Brooklyn, New York. Offering in-depth horoscopes, astrological consultations, and custom written reports for unconventional people. Ancient Magic for Modern Times. Horoscopes, astrology readings, and life coaching. Sign up for your free moon cycles guide. Thank you for signing up! Please check your email and confirm your subscription to receive your free guide. If you enjoy reading these weekly horoscopes, monthly forecasts, blog posts, and newsletters, please consider a monthly subscription to support the work. If you know your rising sign and sun sign, please read both. 30 minutes of free coaching! A 75-minute natal chart consultation for new clients. RT @VictorOlliver: I am now calling all journalists 'journalers'. #astrologist? Why would you book more than one astrology reading? Sign up for the Lunar Letter and get your free guide to working with moon cycles. Copyright Rebel Astrology 2016 - 2019. All rights reserved.